This washer is an improvement over some of the other offerings from the Affinity series, with its greater capacity, steam wash option and NSF certified bacteria cleaning power. It still boasts of the typical Affinity features, such as the Stay Put door, silent design, time saver and fresh water rinse. There are just other helpful options that are welcomed on board. WashSense technology, is the Affinity series mainstay feature. This particular model of washing machine, however, is NSF certified. This means that the cleaning is more than superficial, with 99.999% of germs destroyed per load. The inclusion of steam improves the removal of stains. 10 wash cycles. One of the highlights of these wash cycles is the Certified Allergen cycle, which removes 95% of possible allergens. Other cycles include Whitest Whites, Bulky and Deep Clean Sanitize. A full load can be washed and dried in a span of merely 50 minutes. A quick wash cycle can cut that time in half. The Energy Save option, on the other hand, cuts the energy consumption a further 60%. 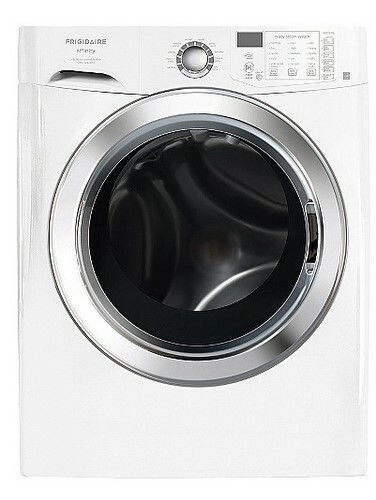 The washer is already established as an energy saver having been Energy Star certified. The Silent Design and Vibration Control System provides the consumer with headache-free operations as the FRIGIDAIRE FAFS4272LW emits minimal vibration and imperceptible noise. The exterior color is classic white. Alternative colors are classic blue, classic silver and classic red. Stay Put door. The washing machine’s door only opens when not on operation. This same sturdy door can also seal in the freshness of the load when kept closed. An optional SpaceWise Pedestal drawer is included. The control panel presents easy to use buttons. A push of a button selects one of the options available in the washer. The design is also modern. Cycle status lights are included to indicate how far along a load is. The chime status signal can definitely catch the attention of the user. It is NSF certified. Using this washing machine to clean clothes will not only get rid of surface dirt but also of invisible germs and bacteria. The bacteria cleaning capability combines well with the Affinity series’ WashSense technology. The inclusion of steam is great for stain removal. At about $800, the washing machine is reasonably priced given all the features that it can offer. The TimeWise feature allows the garments to dry during the washing time. The consumer will save a lot of time and a lot of money in energy bills, as well. With 4.2 cubic feet available, the washing machine offers good capacity. The product does not go much beyond the basic wash cycles though it does over quite a bit already.